Nobody Gets Out Alive was followed up with A Change is Gonna Come – thematically he was pretty consistent with his moniker – a pessimistic dystopic view of the world and human society in particular. Sometimes it’s hard to disagree with that kind of view! The mood was lightened somewhat by a song that unfolded a catastrophe that all started with a blind boy losing control of his grandmother’s wheelchair. I know, right? I missed a couple of titles, but Against the Law and Working Man Blues led up to a rousing finale of a cover of Louis Armstrong’s Down By The Riverside. Really enjoyable. Brad Dear is of course massively familiar, I’d bumped into my mate Phil who used to come and see FD and by proxy Brad lots back in the day when their gigging circuit had a lot more of a local bias, so it was interesting to get his take on how much more confident Brad was on stage from when he last remembered him performing. It’s definitely true, he’s always been an excellent performer but as the years have gone by he’s really started to look incredibly comfortable on stage whether it be in solo or band guise. It was Brad who first greeted us on getting into the venue, visibly excited behind the merch desk at the chance to get to play at the last minute – bless him! 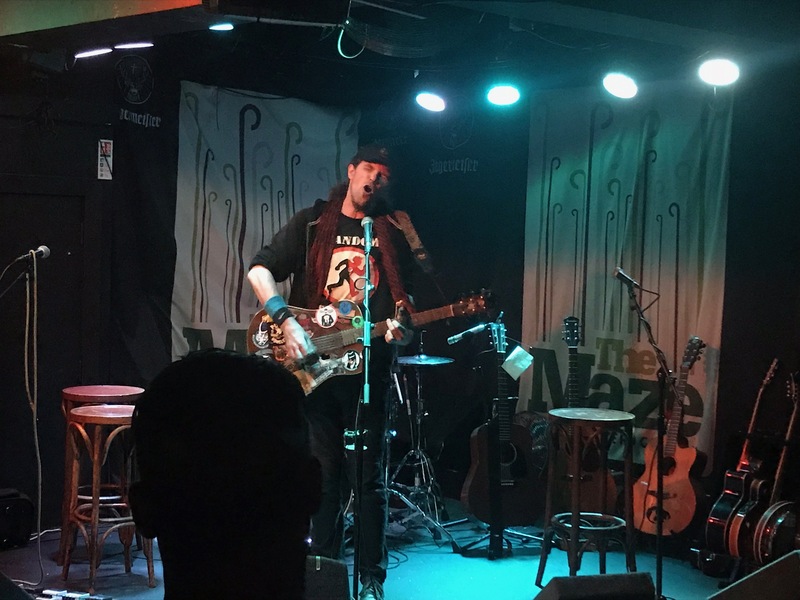 He’d had to cancel his open mic night up at The Plough, which is a shame – but well, sometimes you just have to grasp opportunities that come your way. He launched into A New Song which still presumably hasn’t been named, then into the very familiar Circles and Roundabouts. One of my favourites! Next up was Sail Away then one I’ve had a total brainfart of the name of, all themed around finding yourself (sorry, Brad). Far Away was after this, melodic and lovely – followed up with the pacier Leave It All Behind. EP title track The Only Road I Know was up next and penultimate track Billy Brown was controversially not followed with Special Brew, but I’m Still Here is a cracking song too. Top set. I bet he was regretting wearing the jacket by the end! 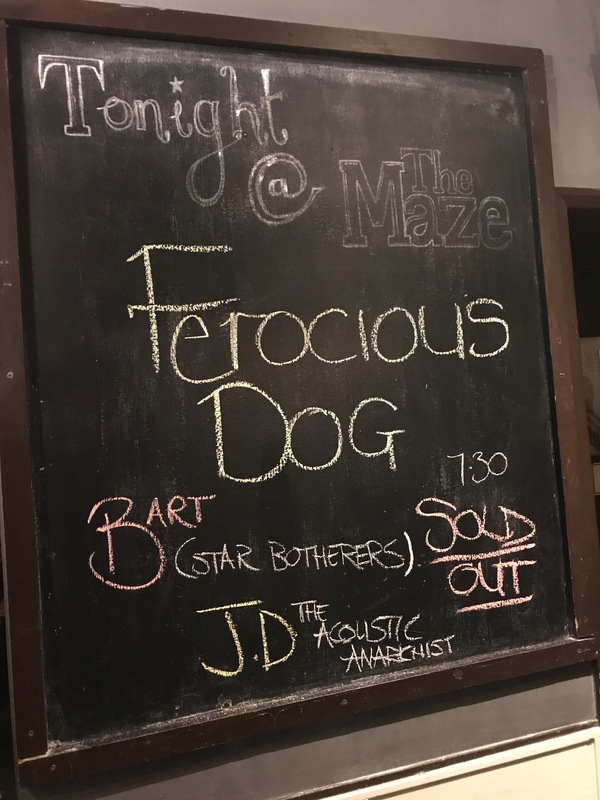 Which left us with Ferocious Dog – definitely in casual mode – a drum kit and three stools awaited them – there was no atmospheric intro music, and no mohawk for Ken. Although of course it wasn’t quite going to be a lounge set, let’s face it! They launched into seldom-heard-these-days On The Rocks, so seldom heard that a good chunk of the sell-out crowd looked a bit confused at the ‘Heys’ being contributed at the appropriate moments from the crowd, haha! Just as Ken was starting to engage in some banter he was rudely interrupted by John striking straight into Ruby Bridges on banjo. Crime and Punishment followed, with a fiddle and whistle driven instrumental to finish. 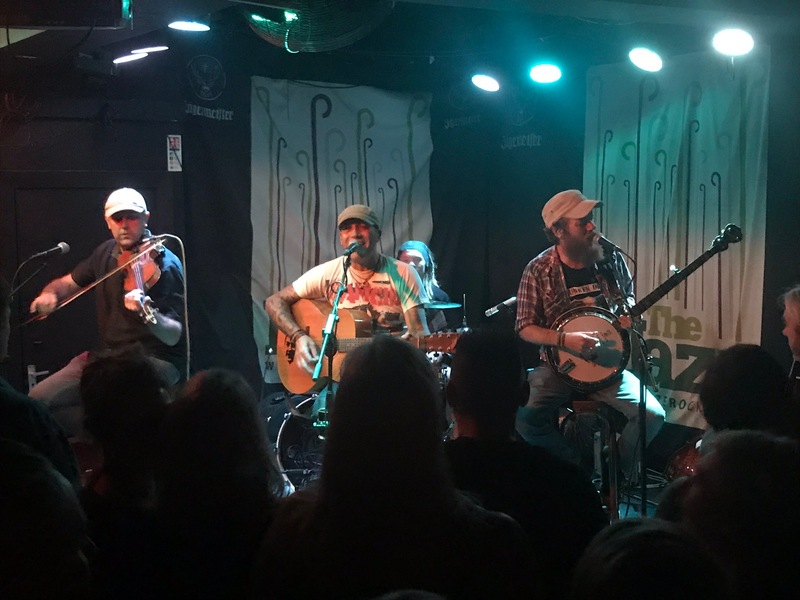 The pace dropped for Verse for Lee, movingly sang back by most of the room and then into The Glass – John has clearly put a lot of work in on his banjo (I asked him after, and he looked dead chuffed that I’d noticed!). Not that he wasn’t doing a great job, but it was abundantly clear to me he’s put in some real hours in mastering the intricacies of the FD banjo songs. The Glass was of course next and then Lee’s Tune – which I think had a few extra bars chucked in at the end! That heralded the start of what was a pretty gentle mosh pit, John picked up his guitar and got ready to start Gallows Justice only to realise he needed his bouzouki – oops! I was half hoping for the gentler paced acoustic version I’ve heard before but it was the full-on paced version, and probably needed to be to maintain the mosh pit! Poor Angry and Young was next – I’m utterly convinced that Ken was actually singing Four Angry Onions at the end – I’m taking his comments after about watching me making notes as confirmation of this! I hadn’t clocked the problem at the start of Too Late at all – Ken started then stopped singing, letting the crowd take the slack with some degree of skill it has to be said. Then it dawned that John hadn’t got his capo on, so was playing in completely the wrong key. Once that was sorted the gig was back on track (Waggy has a video of the moment in question). Mark’s heckle of “Bring back Issac!” was pretty amusing, harking back to how amazingly he did with the same song for the opening set at Farmer Phil’s last month! 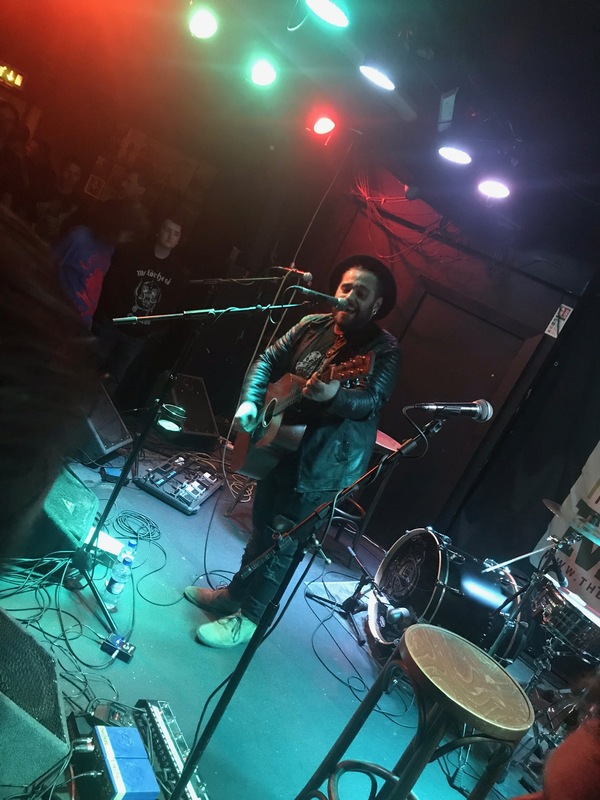 Unconditional had a swear in it, then it was on to some new songs – A and B was sublime, Dan’s confidence in taking on vocal duties shone through, with John picking up backing vocal duties rather than accompanying the whole track as we’ve seen before. Once again Waggy was on hand videoing so you can see that for yourself! Dan and John harmonise brilliantly, but it’s good to hear Dan alone too – it’s a beautiful song about a harrowing topic, and a real new facet to the kind of sound FD are producing (there’ll be more of that too come album launch!). Lyla saw Waggy on stage to do ‘the roar’ – pretty effectively I’d say – then back to new songs. Sorry Ken, it is one I’ve heard already – mwah ha ha! Black Gold is in theme with Ruby Bridges but this time in terms of issues of racism deals with the slave trade. Marikana Massacre had a false start, Alex was in acoustic mode, Dan turned round to say “Come on Alex, they WANT it!”, so it was restarted at its proper pace. Another one I’ve not heard live for a while, so that was somewhat of a treat! 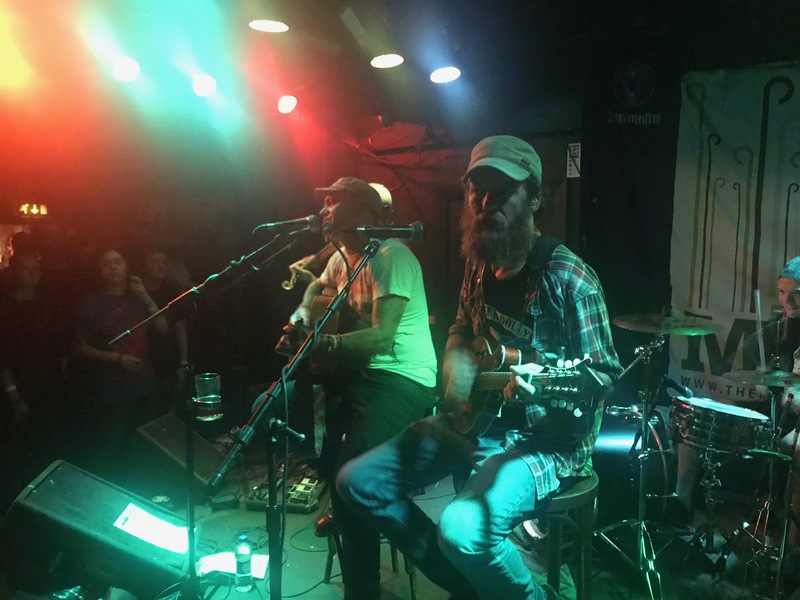 The Enemy Within is another new song, picking up on the common theme of issues around the miner’s strike, a phrase coined by Thatcher in describing Scargill and the striking miners – reappropriated somewhat as a badge of honour by those involved. Dan launched into Quiet Paddy before John had his whistle ready, but once restarted it all went very smoothly, culminating in John smashing Alex’s cymbals with aforementioned whistle, new again Johnny I Hardly Knew Ye is the latest nod to a traditional song, and it properly rocks. Hell Hounds always gets the crowd bouncing that little bit extra – as ever it was dedicated to Jay and Kurtis. It was amusing watching folk barrel to the front for a bit of a tear up (it was still a pretty tame mosh pit, but that’s probably a good thing given how low the stage is!). By this point John can’t resist taking more regular wanders from his stool, being still on a stage doesn’t suit him clearly! Raggle Taggle Gypsy got a welcome airing, and then Criminal Justice. As Alex struck up the drum beat for Mairi’s Wedding Part II I wondered whether he was playing with brushes rather than sticks, I couldn’t tell you if that was the case for the whole gig. 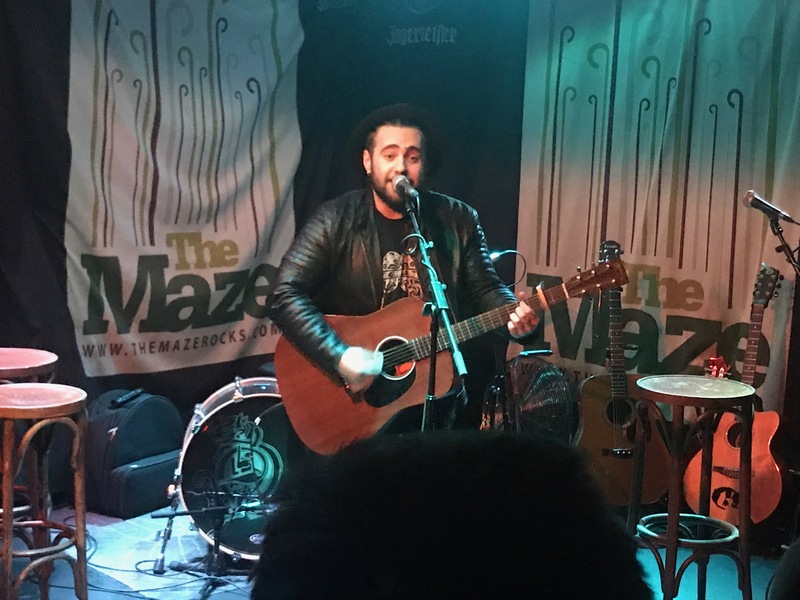 Of course the final track was Slow Motion Suicide which was a soaring conclusion – culminating in Dan’s seemingly ever tweaked with fiddle solo at the end (and also Dan adding backing vocals – don’t think I didn’t notice that!). 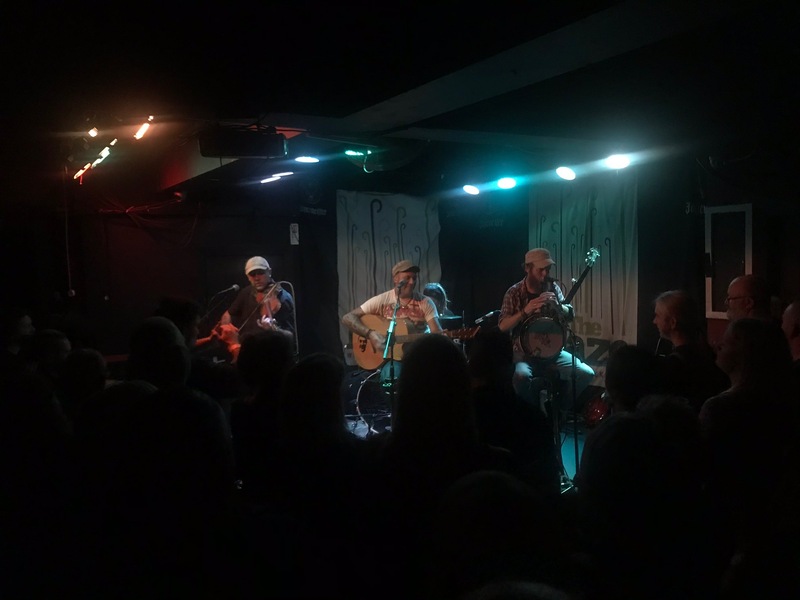 An excellent set – a solid hour and a half sprint, the band full of banter and smiles – they genuinely looked to be loving every moment, little mistakes and all – and the crowd reflected that right back at them. John proclaimed it was his favourite gig yet, Dan called him an arselicker. All that remained for us was to say goodbye to folk and hotfoot it for the kebab we’d promised ourselves on arriving at the venue already feeling peckish. It was well worth the wait! One of my favourite FD gigs for a good while.